This article is about the character, Toad. For Peach's neutral special move in Melee, Brawl, Smash 4 and Ultimate, see Toad (move). 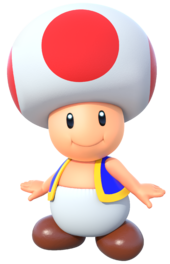 Official artwork of Toad from Mario Party 10. Toad (キノピオ, Kinopio) is a recurring character from the Mario games, and serves as Princess Peach's assistant. He plays a sidekick role for the Mario Bros. in the games, often assisting them in a variety of ways on their adventure. Toads are the main residents of the Mushroom Kingdom and serve under the rule of Princess Peach. Toad originates from Super Mario Bros. 2 (known as Super Mario USA in Japan) as one of the four playable characters as the fastest runner, a trait which would return with the playable appearance of a blue Toad in Super Mario 3D World. Toad has been a playable character in numerous Mario spin-offs and a common NPC in most Mario games. In Smash, a Toad appears as part of both Princess Peach and Princess Daisy's move sets. In Super Smash Bros. Melee, Toad is used as Peach's neutral special move which can be used to counter an enemy's attack. Toad is also seen in the background of the first level of Adventure Mode, running behind the arena with the Yoshis, and again behind the finish line. A notable rumor had spread about Toad being playable in Melee. Toad, Peach's longtime servant, first showed off his strength in Super Mario Bros. 2, then proved to be an agile driver in Super Mario Kart. There are many Toads in Peach's castle and across the Mushroom Kingdom, and although they look similar, they have varied natures. Not the best of guards, Toad must often be rescued. In Super Smash Bros. Brawl, Toad is once again Peach's neutral special move. Although Toad is not a playable fighter, he can be used within the unlockable Masterpiece, Super Mario Bros. 2, but first the player has to make Peach lose all her lives in it before time runs out. One of the servants at Peach's Castle in the Mushroom Kingdom. Toads give off a strong sense of peace. Most feature white heads with red polka dots, but there are other colors as well. Toad's incredible uprooting speed in Super Mario Bros. 2 is unrivaled, adding to the rumor of his superhuman strength... however out of place it might seem. : Mario Kart: Double Dash!! Mii Brawlers dressed as Toad. Toad is once again Peach's neutral special, and once again has a trophy. Toad is the basis for a paid downloadable content costume for Mii Brawlers. The Toad trophy appears in both versions. In Super Smash Bros. for Wii U it is part of the Super Mario Bros. Trophy Box. Toad's trophy in for 3DS. Toad's trophy in for Wii U. A race of charming mushrooms that dwell in the Mushroom Kingdom, they prefer to be called Toads... Come to think of it, that's an odd name. It's not like they're very good jumpers. Captain Toad can't jump at all! What's that? ToadSTOOLS? ...That makes more sense. A charming tribe of mushroom people from the Mushroom Kingdom. "Toad" seems like a bit of an odd name for them, though. Like...they may be small, and some are green, but there's nothing really frog-like about them. Captain Toad can't even jump! Oh. Wait. Hold on a sec. "Toadstools"...Nooow it makes sense! The Toad + Quacker trophy is exclusive to the Wii U version; it is part of the Super Mario Kart Trophy Box. Toad + Quacker trophy in for Wii U. Though its appearance calls to mind an infant's toy, the Quacker is really a fully functional motorbike with some serious acceleration. That's because its frame is so light, you might expect it to float on water like a swan boat! But that lightness also makes it easy for other karts to push around, so try to stay out of trouble. Despite just looking like a child's plaything, the Quacker is a fully-functional motorbike with serious acceleration and a frame so light you'd think it'd be able to float on water like a swan boat! That lightness makes it easy for other karts to push it around, though, so avoid drawing attention to yourself as you slip by your rivals. In addition to returning as Peach's neutral special, a Toad also attacks alongside her - as well as her Echo Daisy - for her pummel and throws. The Toad Mii outfit also returns. Toad outfit for Mii Brawler. The panicked Toads seen running in the Mushroom Kingdom stage in Melee have the same animation as the one used in Peach's neutral special move. This page was last edited on March 22, 2019, at 20:52.